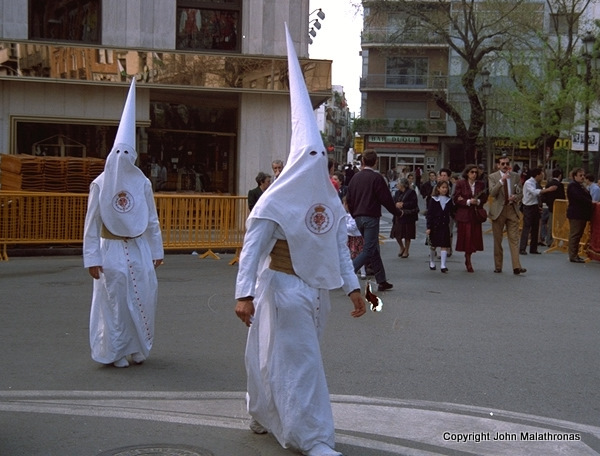 The Semana Santa in Seville, Andalucia’s sprightly capital, is the week of religious celebrations that takes place between Palm Sunday (Domingo de Ramos) and Easter Sunday (Domingo de Resurrección) every year. It is the biggest and most renowned Easter festival in Spain; the locals know it, so prices double and treble during this period. Me, I stayed with friends who didn’t like my timing – the young abandon Seville during the Semana as if zombies had invaded the city. The celebrations center around all-male religious organisations; each church has its cofradía, or brotherhood, whose members, the penitentes belong to the church parish. A cofradía is composed of a Hermano Mayor, the ‘Big Brother’ or president of the brotherhood, a Mayordomo, or secretary, priostes (priests, normally two), a capataz (foreman), a Diputado Mayor de Gobierno, who arranges the parade and Nazarenos who are the ordinary members. 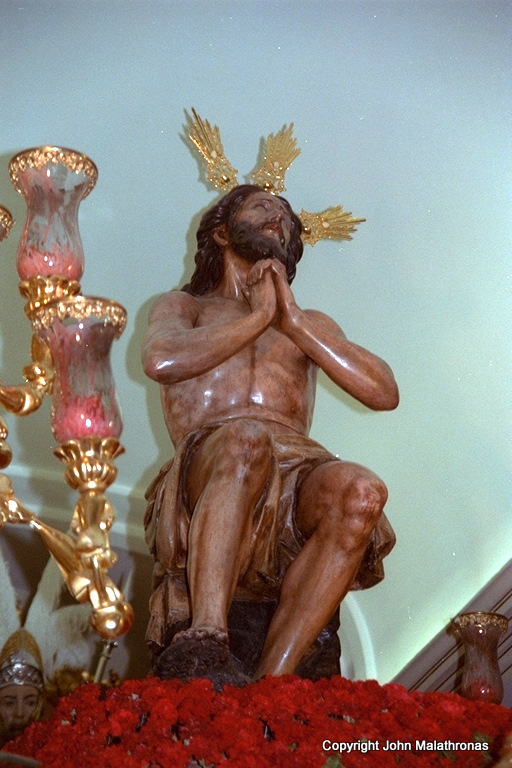 These range between 500-1300 per cofradía and accompany the church’s holy icons and statues in a procession at a particular time during the Holy Week, via a particular circular route. 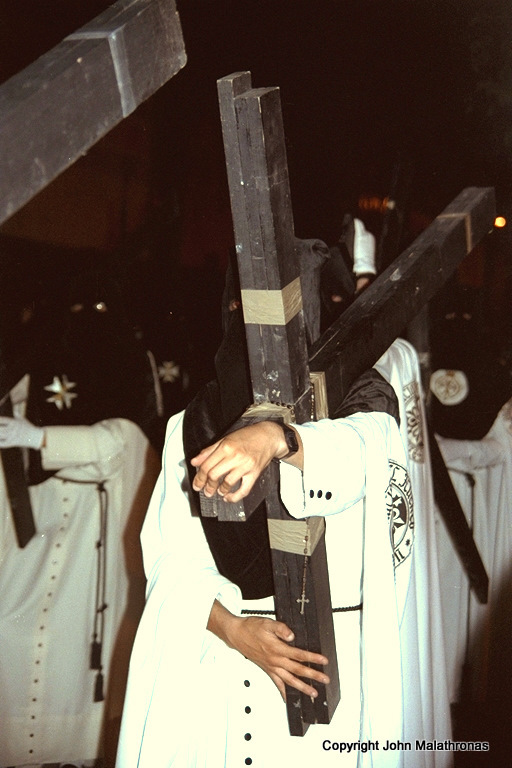 Preceded by the church band, each member is dressed in sombre colours and emblems identifying the cofradía and marches barefoot with a thick rope belt around his waist. What looks sinister to Anglo-Saxon eyes is that everyone is covered in tunics that bring the ku-klux-klan in mind. 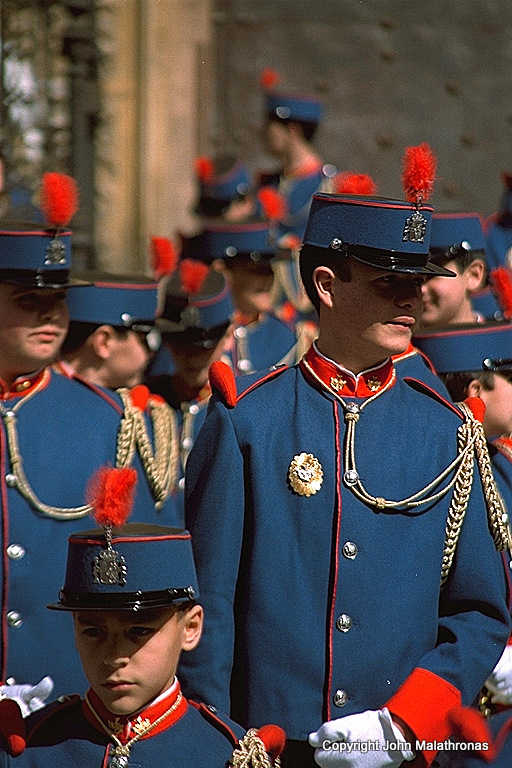 Clearly, this type of dress is to preserve anonymity and equality for the marcher who is doing penance, but if anyone knows of any connection between this attire and the Klan’s outfits, please let me know. The procession consists of a band which marches ahead with the major brothers following and holding high the paso which is normally a gilded baroque statue, illuminated by candelabras and flowers specific to the cofradía. The various pasos tell the story of Jesus during the last week of his life; from his entrance in Jerusalem to his Resurrection. The timings of the processions are such that they follow roughly Christ’s Passion: in other words, if one were to visit each one of the processions sequentially, one could follow the events of the Holy Week in the order laid down by the gospels. But don’t try to. 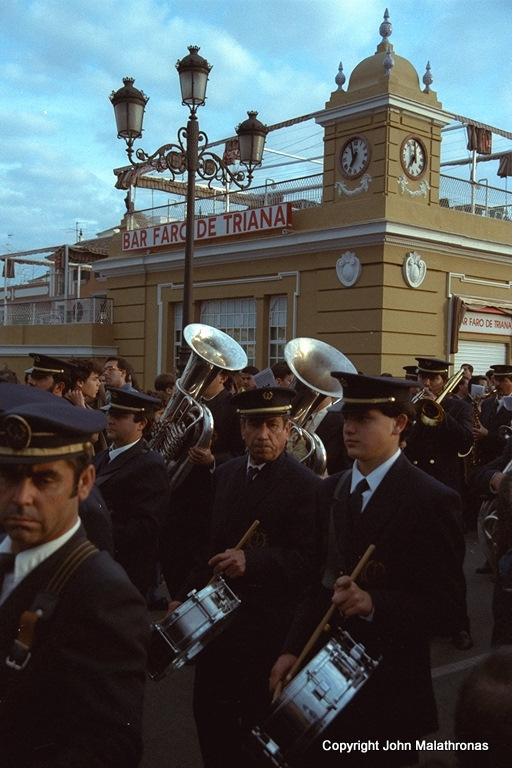 There are fifty-eight processions during seven days through Seville and its sister town Triana across the Guadalquivir. Since they take from four to six hours to complete, it takes no mathematical nous to realise that, while there are 168 hours in a week, there are over 250 hours of processions. 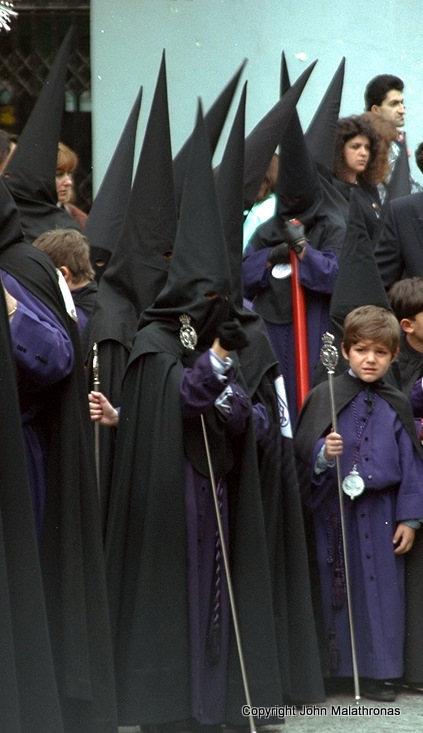 At any time in Seville, there are at least four or five simultaneous processions – sometimes crossing paths which can lead to some considerable confusion. 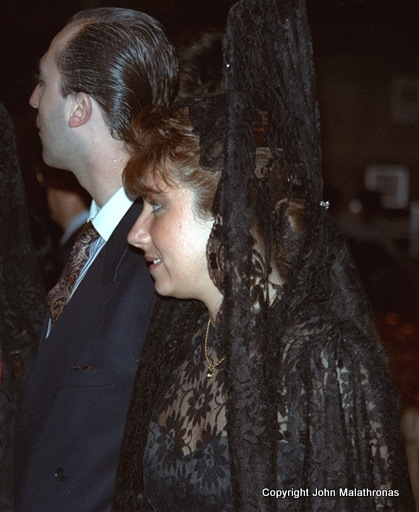 I tell you, on Monday of the Semana Santa at around 9pm – a popular time – there were no less than eight cofradía convoys going on. There are two not-to-be-missed processions, however; the first, is, well, the first: La Borriquita (the little donkey), which opens up the festivities on Palm Sunday around 3pm. This is a paso that commemorates the entrance of Jesus in Jerusalem on a donkey and attracts huge crowds in the Iglésia del Salvador. Apart from it being the first, its other attraction is that it is mostly a brotherhood of boys, preceded by a youth orchestra. For the second, you take your pick, for there are two marches that are guaranteed to clash: the Esperanza and the Macarena. It’s not just that they both start at midnight on Maundy Thursday; this is a clash of cultures. 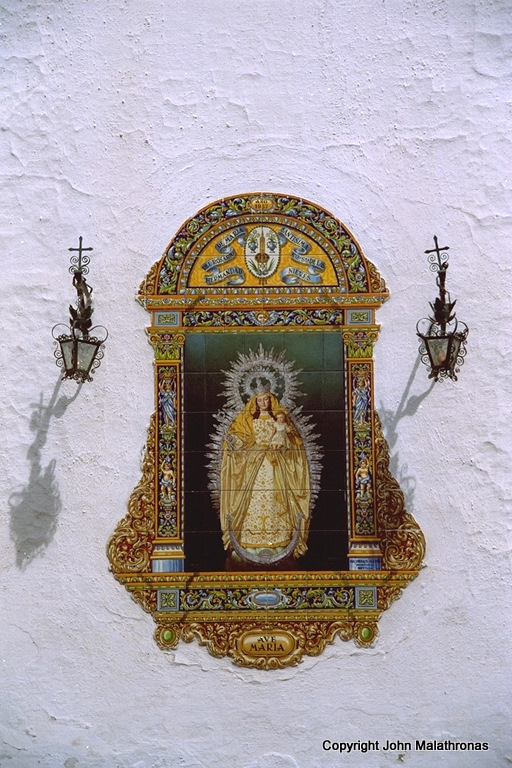 Middle class Seville worships the statue of the Madonna Macarena – oddly enough in the Basilica of Esperanza, Barrio de Macarena – whileworking-class Triana worships the statue of Esperanza and there is considerable rivalry between the two. 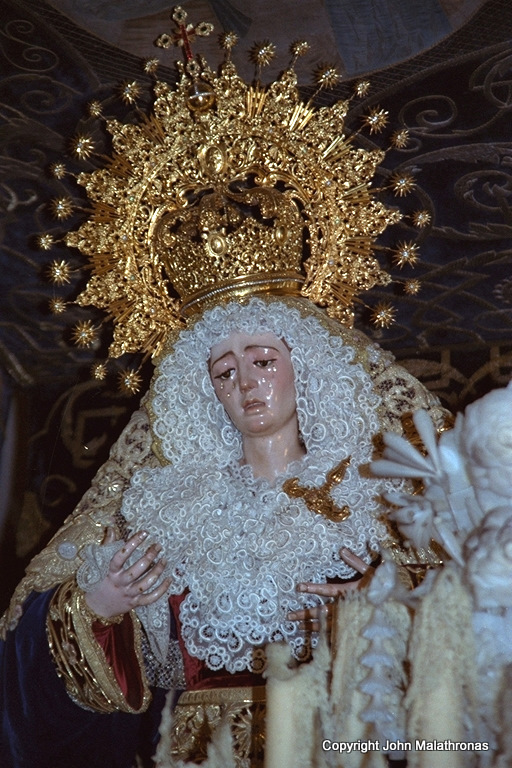 I visited the Esperanza in the humble Capilla de los Marineros in calle Pureza, but as I was staying in Seville, I tagged along the procession of Macarena, deafened by the cries of ‘Macarena guapa! Guapa, guapa, guapa!“. 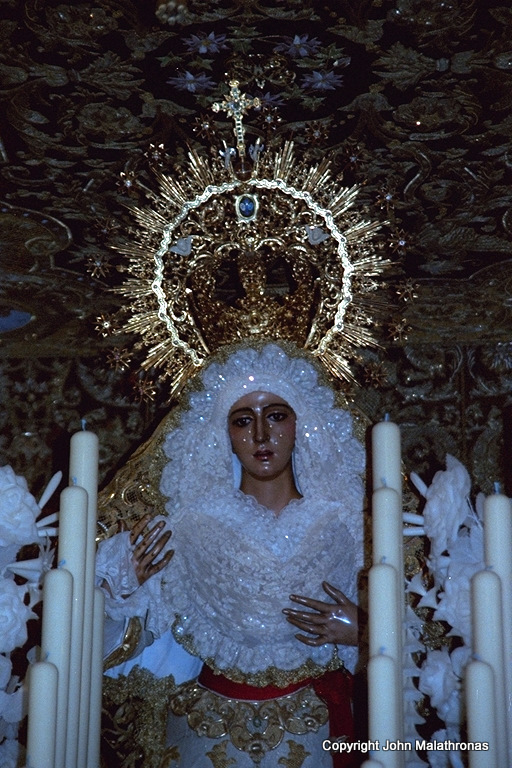 Frankly, the best moment comes when the statue first appears through the gates of the basilica for a twelve-hour procession through the barrio. It is then that a female flamenco belter with the voicebox of a hammer drill sings a dirge to shatter every glass this side of the Guadalquivir. It is also then when you humbly accept, that yes, God must indeed be dead and buried, if you need to roar so loud to reach Her. But jokes apart, it’s all very impressive and photogenic. It’s also very pleasant weatherwise: Seville in early spring is warm but not stifling and the sun is out but not scalding. If you do make the journey, book in advance and remember to ask for “El Cofrade” from the Tourist office, a guide to the celebrations with times and routes.